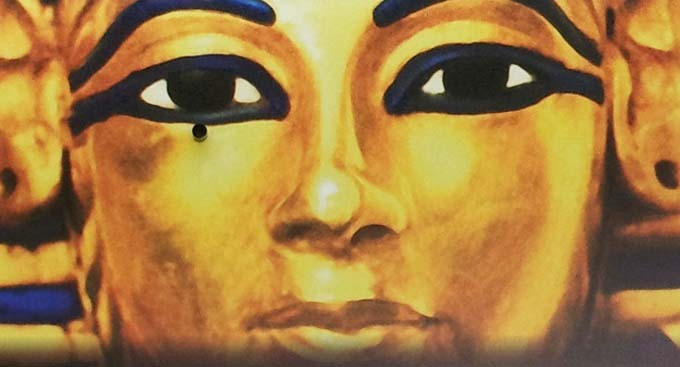 Melbourne Museum responds to ‘Mystery of the Pharoah’s Marketing Campaign’. Firstly, thank you for bringing this perception of the advertising for the Tutankhamun and the Golden Age of the Pharaohs exhibition to my attention. My name is Gemma Levett and I am the General Manager for Tutankhamun and the Golden Age of the Pharaohs, the exhibition organised by IMG and Arts and Exhibitions International (AEI), currently on display at Melbourne Museum. Working for AEI, one of the difficulties that we have faced with regard to the marketing campaign is that we wanted to show the face of the boy king – the exhibition focuses on him, his family, his daily life, and his roles as Pharaoh. Choosing a ‘hero image’ for the marketing campaign was therefore challenging. The Ancient Egyptians produced all of his burial items with the same face – that of Tutankhamun himself. They believed that the face presented on his funerary items would be the face he would have for eternity in his next life, and as such all representations of it appear the same. The image that we use for the marketing campaign, including the image you have included here of the banner outside Melbourne Museum, is that of the Canopic Coffinette which is the centerpiece artefact in the exhibition. Where possible we have shown some of the obvious distinguishing differences – the gold beard (the funerary mask’s beard is blue) and the crook and flail that he is holding (not present on the funerary mask). Where space was limited and we couldn’t effectively use the fuller image, we have included the image credit “Image: Canopic Coffinette. Not the Funerary Mask” to try and avoid any confusion. “Tell me about the mask image used on the front of the advertising. We have also added information screens on site at Melbourne Museum about the content inside the exhibition and the use of the marketing image, as well as increased the font size of the image credit for any new marketing material that is being published or installed throughout the city. As I hope you can see from this, we have tried to be transparent about the image that we are using for the marketing campaign. It is certainly not our intention to mislead anyone coming to the exhibition. Please be reassured that I am continuing to listen to the feedback of our visitors, and take steps to improve the transparency of the exhibition, the visitor experience, and to ensure the continued good reputation of all parties associated with it. So first of all, the images used aren’t those of the death mask we know and love, but of a ‘Canopic Coffinette’ (fancy language for ‘internal organ holder jar’) which is a replica of Tutankhamen mask. Fair enough, though you’d be hard pressed finding anyone other than a career Egyptologist with 12 letters after their name who would notice this (I didn’t notice the addition of the beard – did others?). Then there is the credit attached to the imagery (“Image: Canopic Coffinette. Not the Funerary Mask”) so that people wouldn’t get confused. Admittedly I didn’t see the credit… up on the top of a 20-foot flagpole. Or on the 10m by 5m billboard. My eyes aren’t what they used to be, especially since I didn’t see the extra large-Fonted credits either (and neither did the people who’ve complained about the lack of mask that I know of) – if I had, I wouldn’t have felt the need to point this discrepancy out. What is great to see is that the Melbourne Museum’s team are keeping their ears open – it would have been much easier to keep them closed and ignore this blog. But as many brands have learned in the past couple of years, ignorance isn’t bliss in today’s communications landscape. Within minutes of posting, @Jareen, MM’s social media and online communications representative, tweeted me about hearing from the team directly (hence the response from the GM of AEI). This blog is no criticism of Melbourne Museum nor of its exhibition agent AEI – as I said in the original post, it’s a tough market that they’re in, attempting to attract eyes away from everything from footy to flipper. However, it seems there are elements from this situation that other companies could learn from. Answer this question yourself and be truthful: if you market a product that you know better than anyone, will your consumer know it as intimately as you? Would they recognize subtle differences in its colour, shape or size or smell that differentiate it from something else? Would they really see the fine print during the product’s campaign? Would they still feel a little bit jibbed by the execution if it doesn’t meet their expectations? And thank you Gemma for taking the time to respond to the post.